Richard Goyder AO shares his business parallels at PwC Innovation Centre for the Inaugural RWB Winter Morning Breakfast on July 19. With barista coffee in hand, guests were taken on a brief tour of PwC’s innovation centre including the spectacular Media Hub, where the 2016 Grand Final highlights happened to be playing across the 180 degree curved screen. PwC CEO Luke Sayers warmly welcomed the RWB network to the Innovation Centre. The new offices represent the changing culture of PwC, and are designed to facilitate collaboration and innovation. PwC embraces the ‘art of difference’ and supports diversity of gender, skill sets, different backgrounds and religious beliefs. Luke congratulated the Forever Foundation on RWB, “a great example of innovative thinking”. Campbell A Rose AM, Founder of RWB, agreed that establishing the RWB network was a bold step. The Forever Foundation recognised that if the Club was to grow, it needed to innovate. “If you want to create change, be seen in places you’re least expected to be seen.” said Campbell Rose. Bringing the Bulldogs to the top end of business was bold and unexpected. 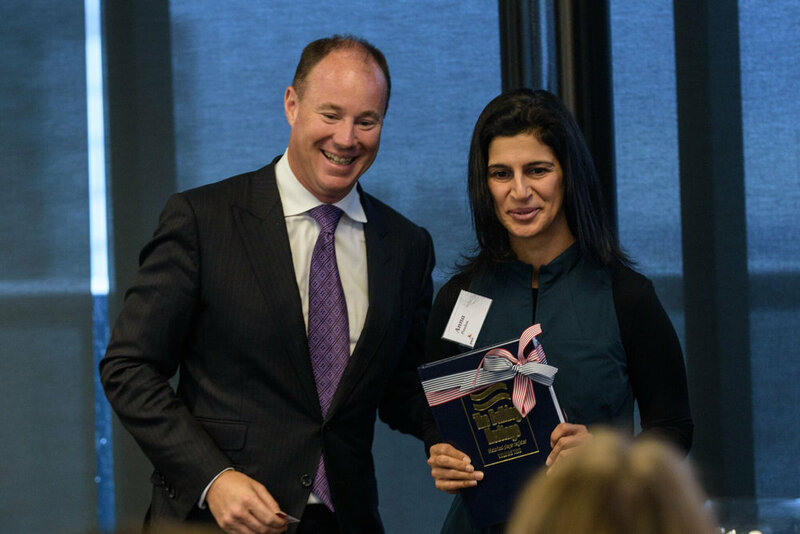 “Who would have believed that Richard Goyder AO would be speaking to 150 influential business women and men with a passion for the Bulldogs, at PwC on a cold winter morning”? asked Campbell. Special guest speaker Richard Goyder AO was introduced to the podium. He admired the RWB initiative and spoke of the passion for football, and what it can do for the community in which a football club operates. 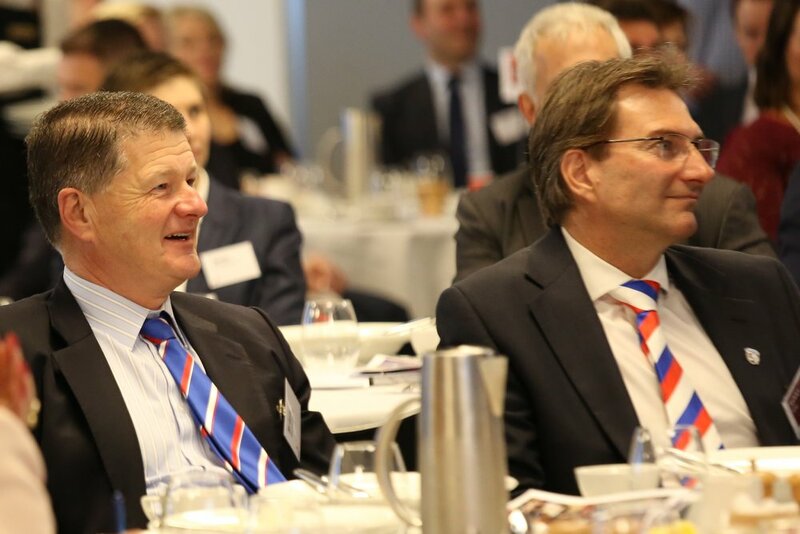 The newly appointed Chairman of the AFL Commissioners enthralled the audience with his experiences to illustrate the parallels between business innovation and the innovation taking place in the sport of AFL Football. He cited the establishment of the Inaugural AFLW, the way the AFL has led the national sporting codes in media and rights negotiation, and the trialing of AFLX as just some of the innovations of this code. Richard spoke of the importance of creating an environment where people can make mistakes and innovate. He observed how Coach Luke Beveridge did this very successfully in 2016, allowing players to take risks on field. Asked about the AFL Commission’s plans for AFLW, Richard acknowledged the immense demand for womens’ football and this being “the AFL’s biggest opportunity”. Corporate support was strong and the Clubs who don’t have a womens’ team know they need one for fear of losing brand equity. In speaking about the future of AFL, Richard said that the Commission is focusing on strong elite competition at male and female level; attracting the best talent; developing strong community engagement and local infrastructure; building strength in community football; and expansion possibilities overseas. Richard commented that not everything would go smoothly, and noted that there are some 1600 AFL journalists ready to report on the AFL’s mistakes! The Forever Foundation particularly wishes to thank PwC CEO Luke Sayers and PwC Partners Ashley King and Matthew Strauch for hosting the Inaugural RWB Winter Morning Breakfast. And a big thank you to Michael Rowland for his role as MC. Michael Rowland watches on as Mr Richard Goyder AO addresses the RWB members. I thought the breakfast yesterday was splendid. Easily one of the best business breakfasts I have attended.